The Elegoo Smart Robot Car V3.0. Update: This sale has ended, but you can still get this item on Amazon for $69.99 with free shipping. Amazon temporarily sold out of these after the Black Friday and Cyber Monday sales, but they're back in stock now! The holiday season is upon us and there are tons of deals for space fans on Amazon, but if you're looking for something special (and educational) for your little space cadet, this STEM robot car building kit might be just the thing. The Elegoo Smart Robot Car Kit V3.0 is on sale for $57.59 on Amazon, down 20% from its typical $71.99 and the lowest its ever been. 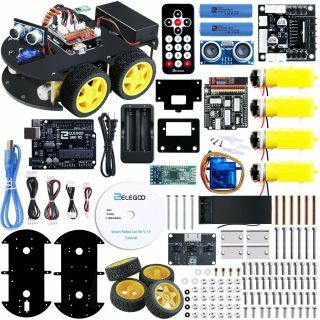 Elegoo's Smart Robot Car V3.0 is designed to introduce little engineers to concepts in robotics, electronics assembly and Arduino programming by building and operating a small rover. The robot car can be programmed for obstacle avoidance and line tracking, and includes an infrared sensor that allows for Bluetooth remote control via an app interface on a smartphone or tablet.